Are you looking to restrict access of your keys? We have multiple means to do just that! We can set your keys up as Do Not Duplicate. We can use a high security key that requires authorization. Or even better, switch over to our high security keyway that no other locksmith in the state can get. It is much easier to secure a place when you know who truly has keys to it. Is your keyring growing to an astronomical size? Looking to reduce the amount of keys you need while still being able to limit access to employees/clients? Give us a call or come in to our shop and we'll discuss the best way to go about that. We can create a custom master key system to help control who has access to each place while reducing the amount of keys needed. For example, the boss may have one key that works all of the building's locks while the accountant only has a key that works his office. 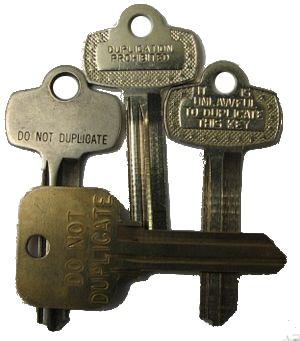 Restricting access of keys can be done by using Do Not Duplicate Keys, High Security Blanks, and our specialized keyway that no other locksmith in the state can get. Residential locks do not hold up to the extensive use commercials need, nor do they provide adequete security. We carry Grade 2 and Grade 1 locks that can withstand that extensive use on top of being more secure.